About to enter its six month, Just Jigsaws meets on a Wednesday afternoon at Wimborne Library. As the name suggests, the emphasis of the group is to bring together people who love making jigsaw puzzles, an activity which is often a solitary hobby, but which is just as enjoyable (and sometimes easier) when working with others. A cup of tea and a piece of cake also help the afternoon along. Just Jigsaws has approximately 150 puzzles which can also be borrowed by those attending or calling in on a Wednesday afternoon between 2.30pm and 4.30pm. The group also offers a mobile lending library of puzzles. For a small fee puzzles can be borrowed and these will be delivered and then collected after a week or fortnight. A catalogue of puzzles is available for borrowers to select ones they would like to make. If you would like to be a borrower or know someone who would benefit from this service please e-mail justjigsawswimborne@gmail.com or phone Ruth on 01202 880827. Otherwise, why not pop in on Wednesday afternoon at Wimborne Library. 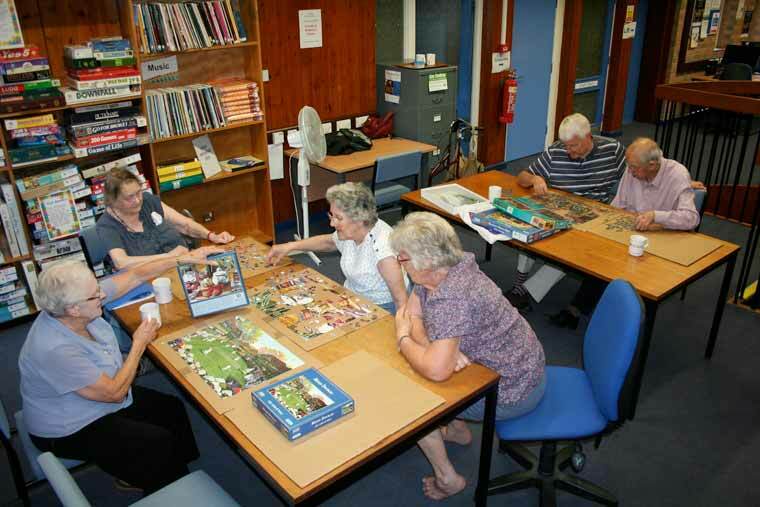 Just Jigsaws was originally funded by Dorset POPP – Partnership of Older People Programme.